Keeping that caveat in mind is important when pondering “what comes next” after the April 9 Knesset elections put Prime Minister Benjamin Netanyahu on track for a fifth term leading the country. Slightly more than 68 percent of eligible Israelis voted. Of the 39 parties listing candidates, 11 met the 3.25 percent vote threshold necessary to earn seats in the 120-seat Knesset. Netanyahu’s Likud party garnered sufficient votes to win 36 seats. The opposition Blue and White will hold 35 seats. 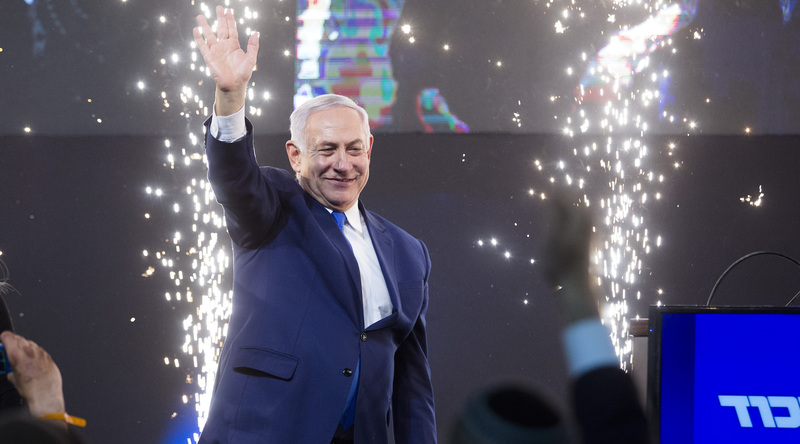 What made this a victory for Netanyahu was the performance of right-wing and religious parties that might be Likud’s natural allies to form a majority bloc in the parliament. “Might” being the operative word. Netanyahu could confound the conventional wisdom by creating a somewhat less right-wing “unity government” with Blue and White, though Israeli commentators think this the less likely option. In the new Knesset, two religious parties – Shas, representing Mizrachi Jews, and United Torah Judaism, representing the Ashkenazi – will hold 15 seats. The Union of Right-Wing Parties won five seats and Kulanu, an economy-focused party, won four seats. Combined with Likud, they would form a bloc of 60 seats, one short of a majority. Former Defense Minister Avigdor Lieberman leads wild card Yisrael Beiteinu, a secular nationalist party that holds five seats. The wild card appears to be the five seats held by Yisrael Beiteinu, a secular nationalist party led by former Defense Minister Avigdor Lieberman. Its support for drafting young ultra-Orthodox men into the Israel Defense Forces would be opposed by the religious parties. Notable in its absence from the Knesset will be the New Right party, formed by former Education Minister Naftali Bennett and former Justice Minister Ayalet Shaked, which fell short of the 3.25 percent threshold. If Netanyahu forms a right-wing/religious majority, the opposition would be led by Blue and White, presuming that the individual parts of that party remain a whole. Also in opposition would be Labor, no longer a power in Israeli politics, with six seats, and Meretz, a left-wing party, with four seats. Separate in their opposition would be two groupings representing the interests of Arab citizens, Hadash-Ta’al, with six seats, and Ra’am-Balad, with four seats. The Central Elections Committee was to present certified results to President Reuven Rivlin on April 17. Parties joining a Netanyahu-led government will want something in return, including control of particular ministries. This can be a tricky business, akin to arranging the seating chart at a meal of family members who don’t always get along. If Netanyahu successfully divvies up the spoils, several important issues fill the “what next” category. What will the Trump administration’s long-awaited Middle East “grand plan” require of Israel and what will it offer Israel? There is little reason to think that renewed talks with the Palestinians will be a priority, given Netanyahu’s aversion to the two-state solution and the possibility that, whatever form the new government takes, there might not be sufficient votes to support such an agreement. What about Netanyahu’s pre-election talk of possibly annexing the settlement blocs in the West Bank? That might hinge on the Trump plan and who Netanyahu partners with in the Knesset. There likely would be greater support for annexation among right-wing and religious parties amid warnings from the left about international objections and perhaps a third intifada (Palestinian uprising). What about the future of egalitarian prayer at the Western Wall and the status of non-Orthodox movements? Netanyahu already has backed away from a Western Wall agreement because of pressure from the very religious parties that have increased their ranks in the Knesset. Then there are the pending indictments against Netanyahu in connection with three corruption cases. A pre-indictment hearing will be held by mid-July. There is no law requiring an indicted prime minister to step down (as there is for other Knesset members). One closely watched item will be whether a right-wing majority would advance legislation that would retroactively bar a sitting prime minister from being indicted. As it stands, Netanyahu – who has been prime minister since 2009, and from 1996 to ‘99 – is about three months away from becoming Israel’s longest-serving premier, surpassing the tenure of Israel’s first, David Ben-Gurion. As the next Israeli government is sorted out, keep in mind the words of philosopher (and New York Yankees catcher) Lawrence “Yogi” Berra: It ain’t over ‘til it’s over.